Doesn’t that just sound good? 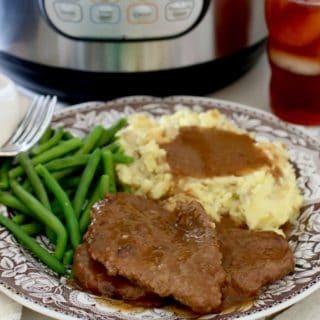 One of my most popular recipes here at The Country Cook is my Crock Pot Smothered Pork Chops. 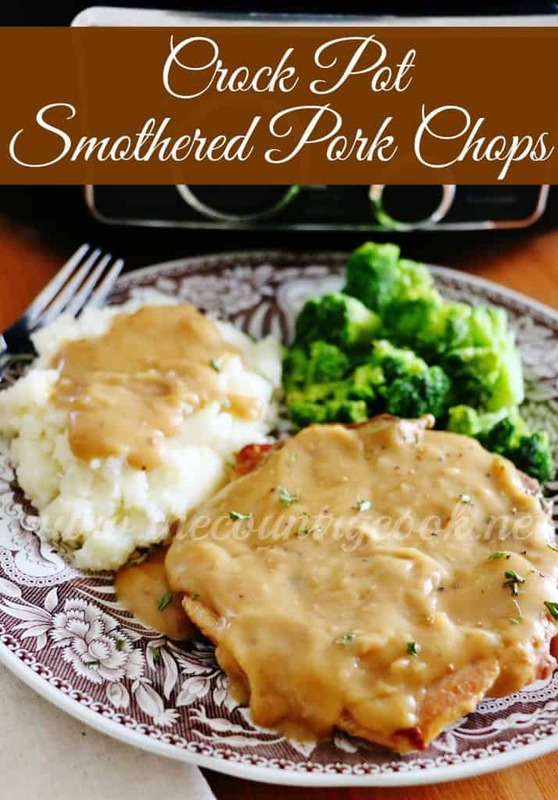 If you love pork chops and brown gravy – you’ll definitely want to check that one out. 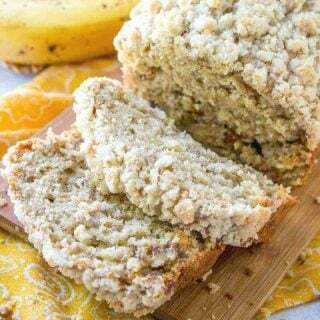 When I was brainstorming new recipes, I thought it would be great if I could add some sort of veggie to it and have it still be a one-pot, slow cooker meal. 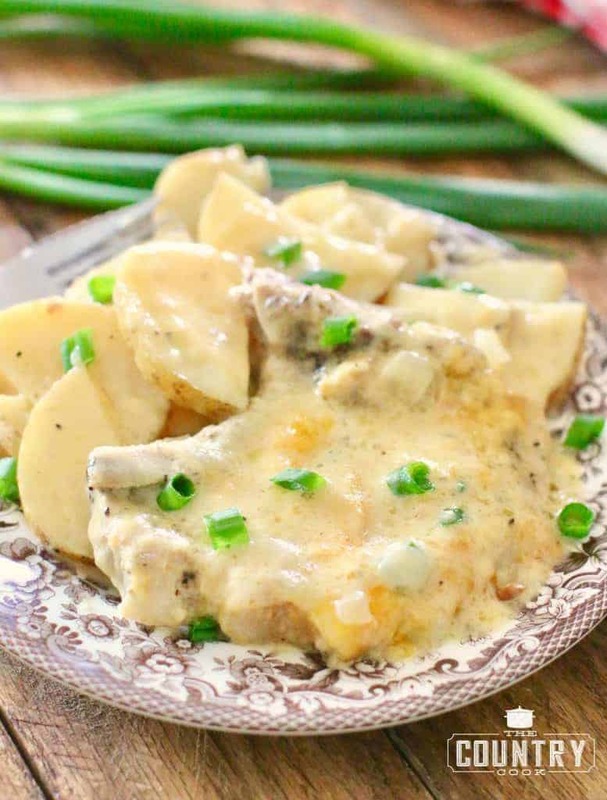 I wanted the potatoes to be similar to au-gratin potatoes (with a creamy, white sauce) and I wanted to give lots of flavor to the pork chops. 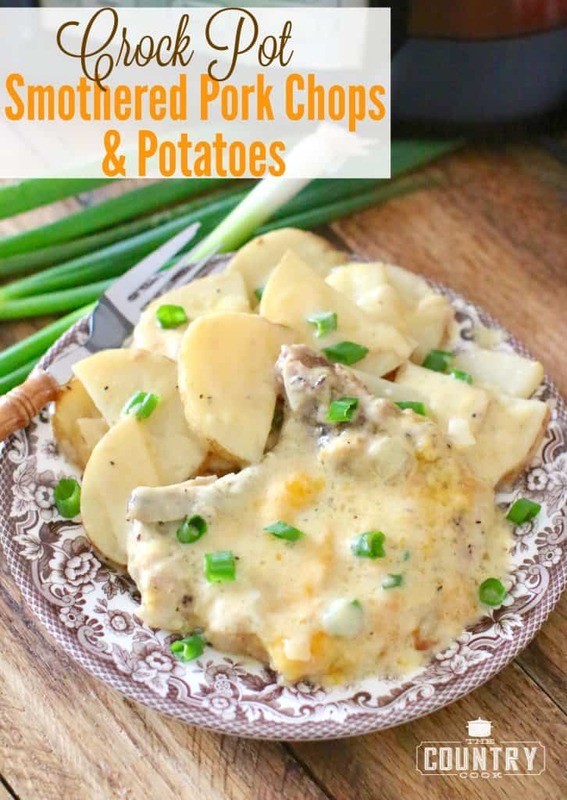 I was so happy with how this recipe for Crock Pot Smothered Pork Chops and Potatoes turned out. 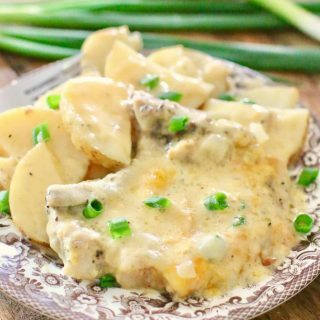 You get lots of creamy, cheesy, tasty white sauce to smother over your pork chops and potatoes when serving. So good! Heat olive oil in a large skillet over medium-high heat. Note: I have a slow cooker that also has a saute option so I am able to brown my meat in the cooker. 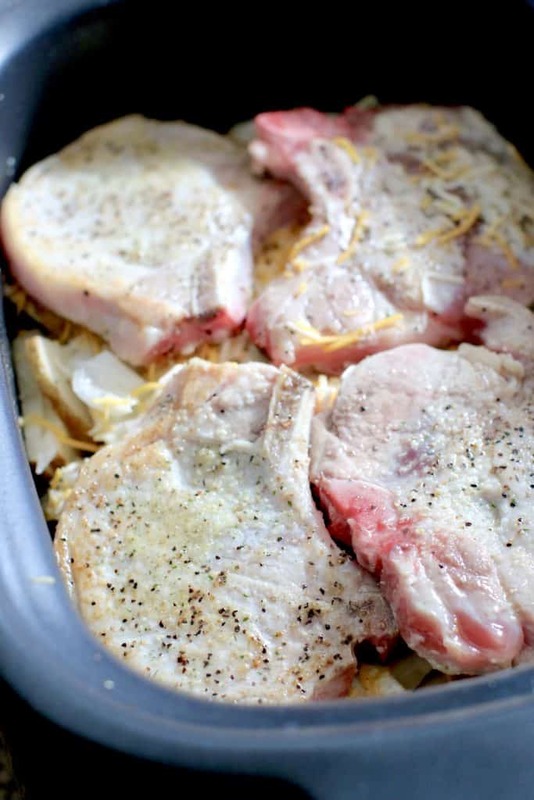 Season pork chops with salt and pepper. 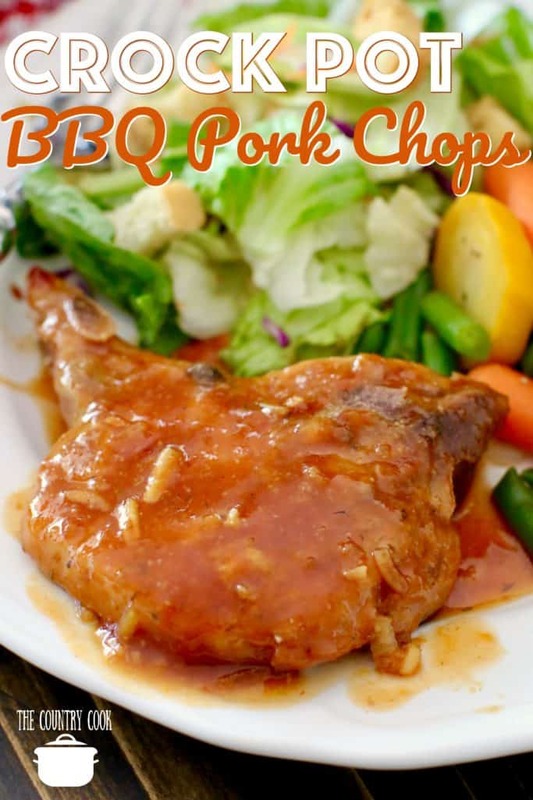 Brown both sides of the pork chops (don’t fully cook the pork chops – just a minute on both sides to get them brown.) 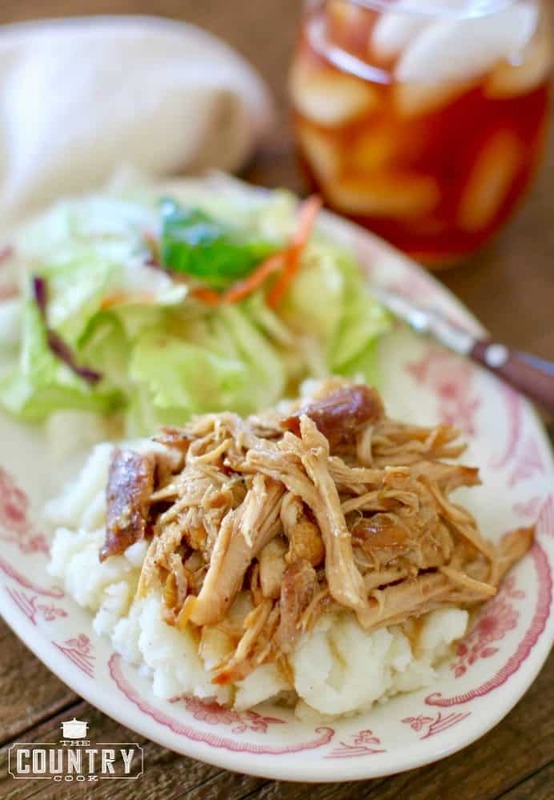 Set aside pork chops. 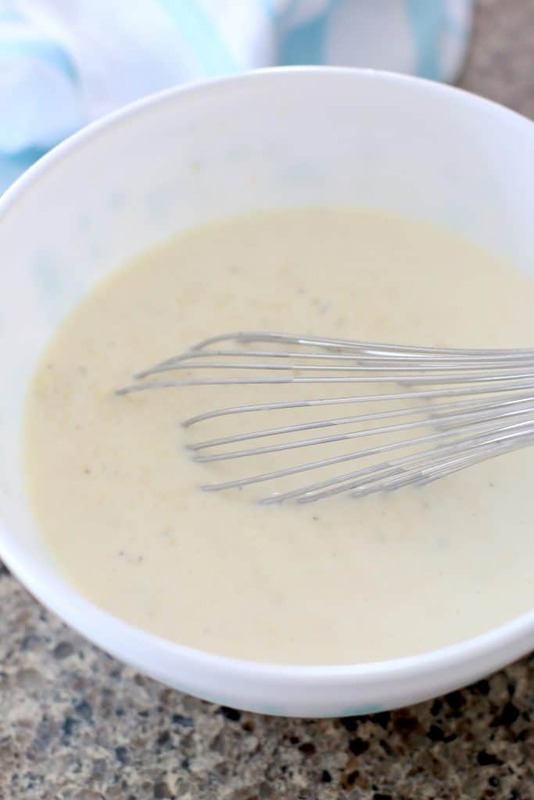 In a medium bowl, whisk together the cream of chicken soup with the heavy cream, milk and minced garlic. Set aside. NOTE: Because this seems to be CONFUSING so many people. From this point on, I will call this the SAUCE mixture. It’s all the same thing. It’s a sauce made from a can of soup, heavy cream and milk. 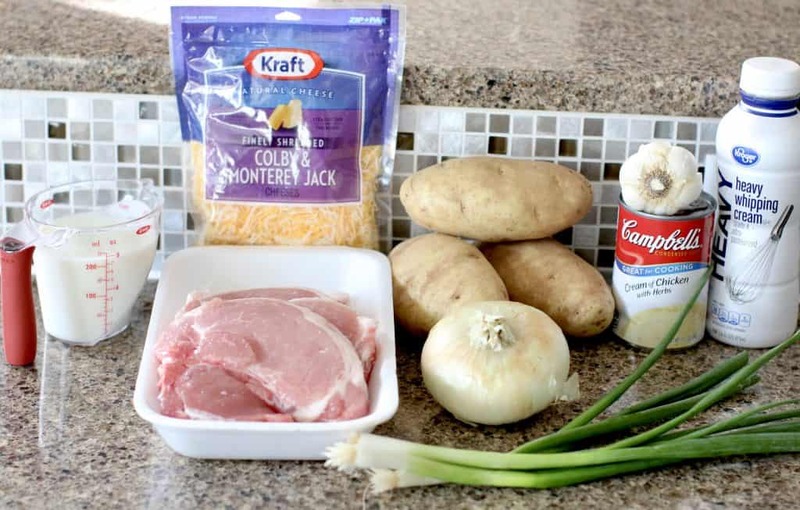 Slice potatoes and chop onions. 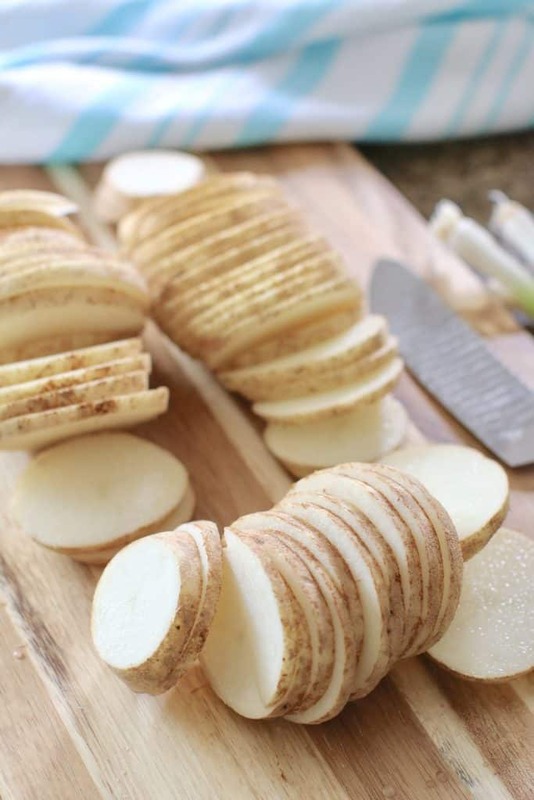 Note: You could slice the potatoes in half (to make a half-moon shape) after slicing them lengthwise to make them more bite-sized. 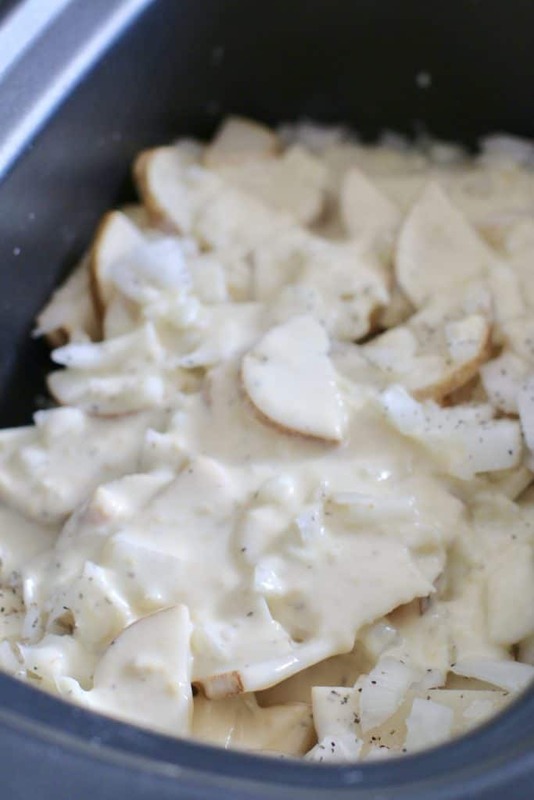 Spread the sliced potatoes and the onions into the bottom of a 5 quart or larger oval slow cooker. Season with salt & pepper. Spread half the sauce mixture on top of the potatoes. 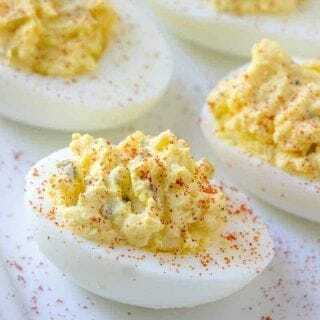 Sprinkle one cup of shredded cheddar cheese on top. 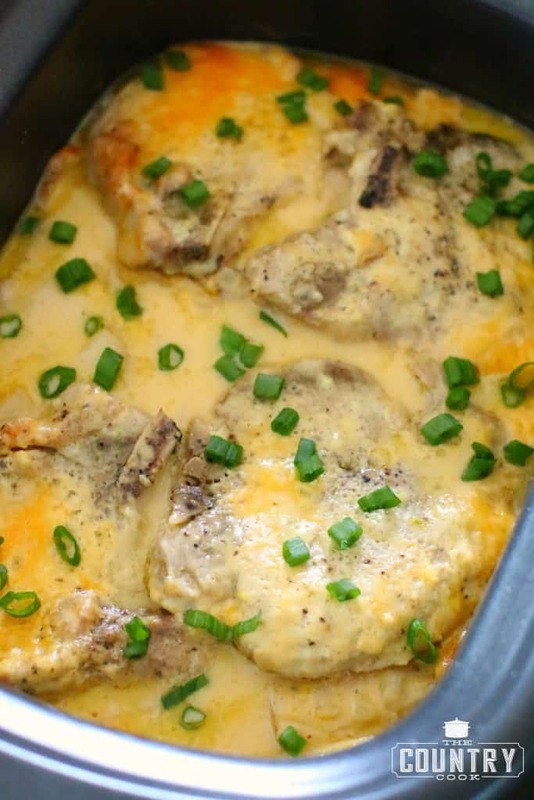 Place pork chops in a single layer on top of cheese. Spread the rest of the sauce mixture on top of the pork chops. Pour remaining sauce over the top. 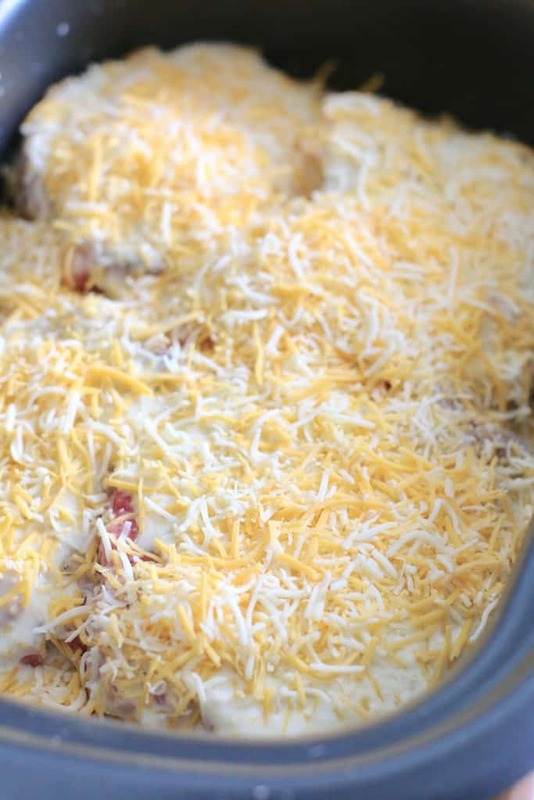 Cover with remaining cheese. 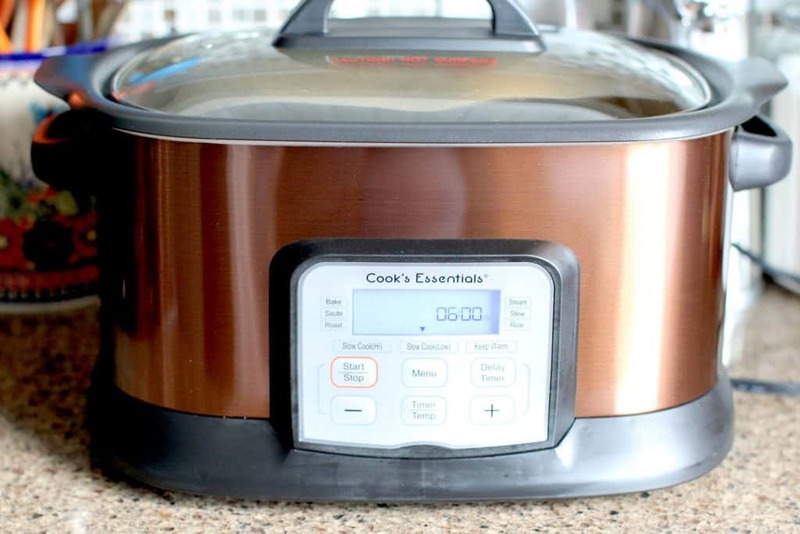 Cover slow cooker and cook on low for 4-6 hours. It ended up only taking 4 hours in mine. When done, sprinkle the top with sliced green onion. Then serve. 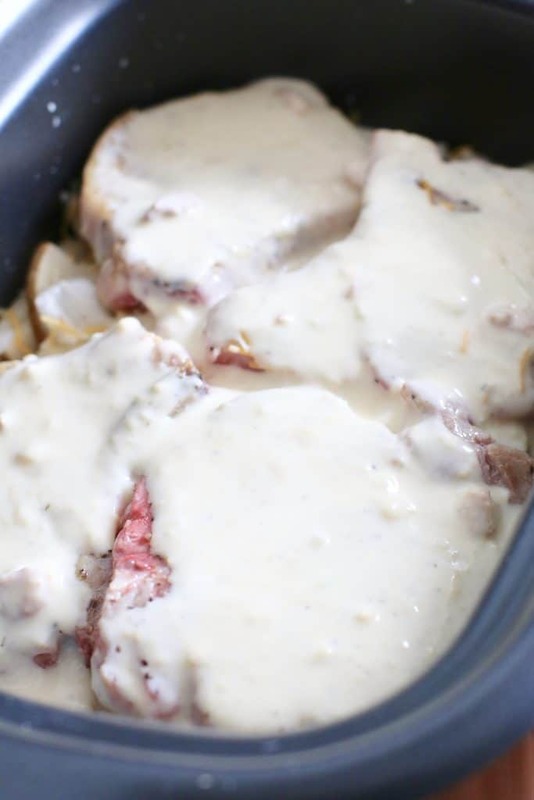 Make sure to add extra cream sauce on top! Heat olive oil in a large skillet over high heat. 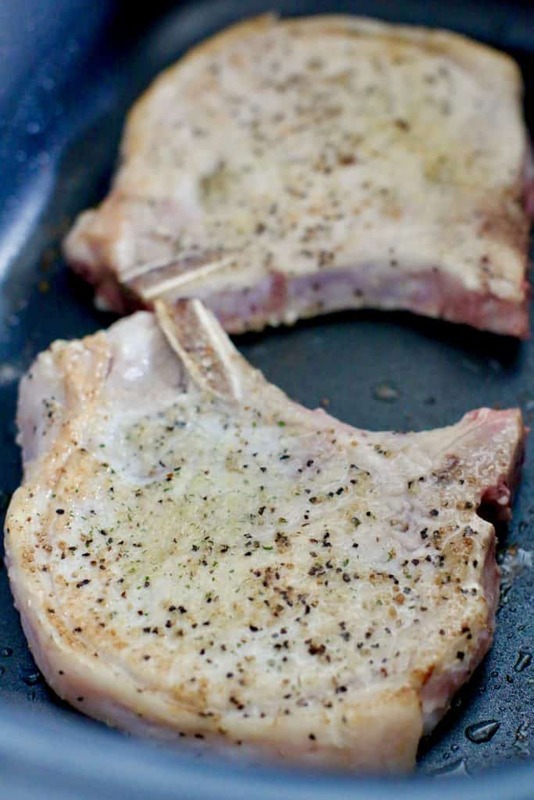 Season pork chops with salt and pepper. Brown both sides of the pork chops (don’t fully cook the pork chops - just a minute on both sides to get them brown.) Set aside pork chops. 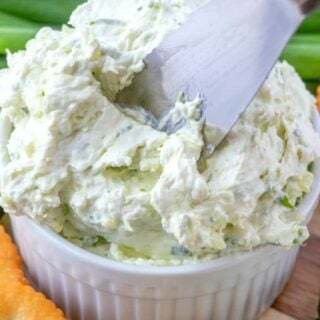 In a medium bowl, whisk together the cream of chicken soup with the heavy cream, milk and minced garlic (this is the sauce.) Set aside. 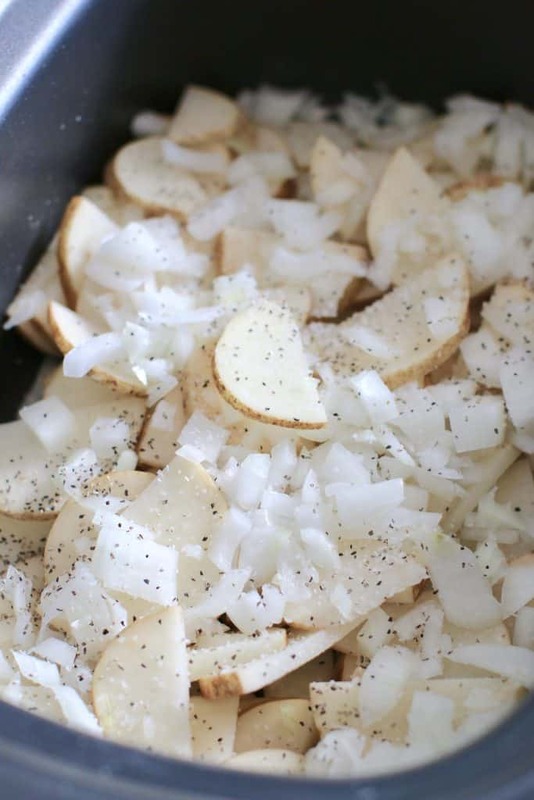 Slice potatoes and chop onions. Note: You could slice the potatoes in half after slicing them lengthwise (into a half-moon shape) to make them more bite-sized if you like. Spread the rest of the sauce mixture on top of the pork chops. 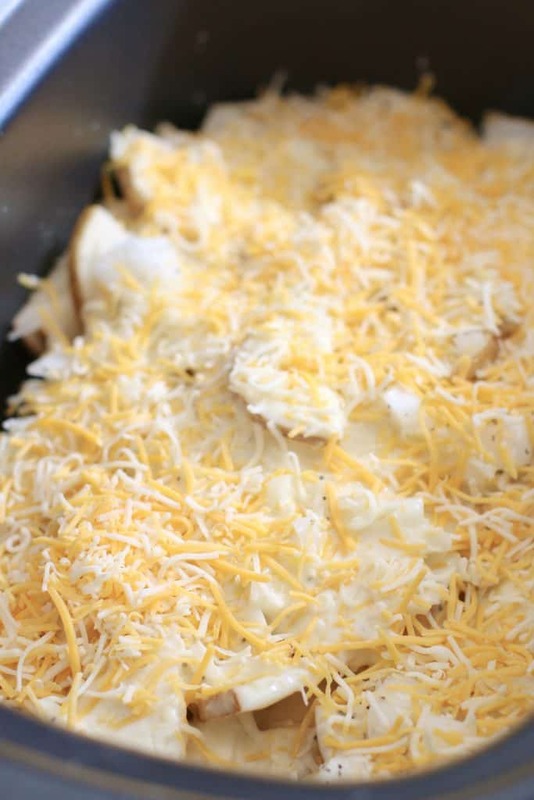 Cover with remaining cheese. Then serve. 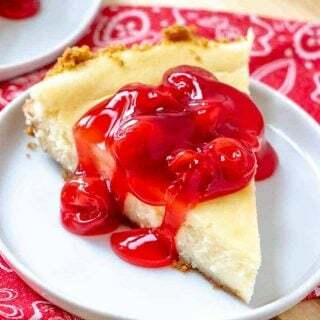 Be sure to spread extra cream sauce on top! 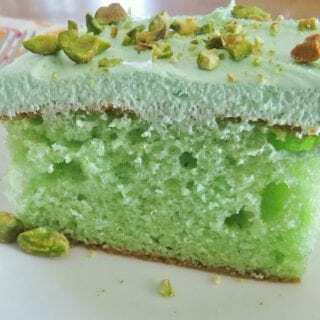 It was really tasty!! I followed the instructions to the T and the sauce came out really watery :(. What the heck did I do wrong? Thanks! My sauce came out watery too. I will let you know the results tonight. 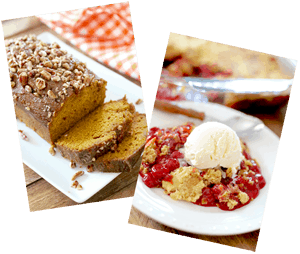 Made this yesterday, very good and easy, we really like the sauce. I used extra thick chops, therefore, I only used two.